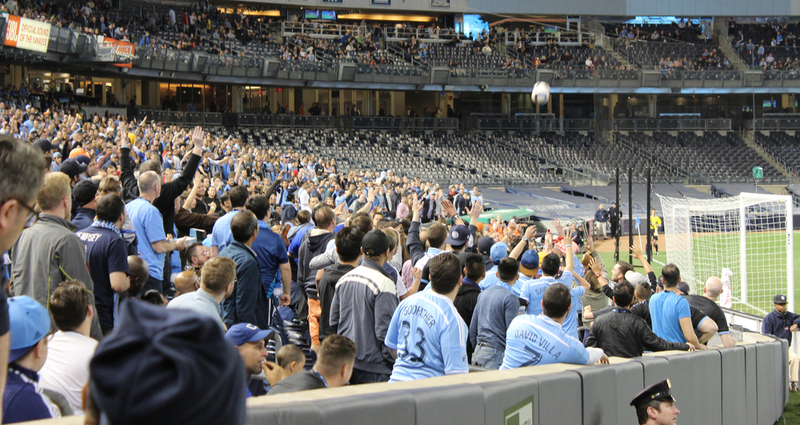 Hands down: the NYC FC vs. Seattle Sounders FC game, on Sunday, May 3rd at Yankee Stadium, was one of the top games of the season. Star studded sporting event! Several soccer celebrities, two amazing teams, and one iconic venue! First, we have the newly debuted New York City Football Club (NYC FC) featuring Spain's highest goalscorer, the world renowned David Villa and United States Men's National Teams' (USMNT) Mix Diskerud. Competing against NYCFC were the 2014 Open Cup champions and arguably the best club of the MLS, Seattle Sounders Football Club (Sounders FC), the 2014, featuring a dynamic duo: Clint Dempsey, captain of the USMNT, and Obafemi Martins, a Nigerian footballer who has played for several international teams. So I could probably write an entire essay about the game- scoring logistics, teamwork, well- coordinated plays, some terribly missed chances, etc etc etc. I'll dive into some stats soon. First, let me tell you about a couple of signs that flashed across the large screens in the stadium which REALLY caught my eye. Well, it's certainly pleasing to see that 'green' really IS everywhere! Upon further research, I found out that Major League Soccer (MLS) in the United States is taking strides to advocate for the environment. By launching it's educational campaign and encouraging sustianable behaviorial practies, MLS encourages it's fans to get involved. MLS partners with the Green Sports Alliance and the Natural Resources Defense Council. These organizations help instill greener stadium/office operations and greener sporting events. Conclusion? It is wonderful to see a huge franchise like MLS, which makes millions of dollars, invest in a social cause that is beneficial for the public community as a whole. So while you're waiting for those passes to turn into a goal assist, take a look at the flashing screen and maybe you'll learn a thing or two. A bit more about the game itself! NYC FC dominated the first half of the game, holding majority possession and staying on the offensive. However, Martins with his fast paced aggression and ability to take advantage of every opportunity, eluded NYC FC and managed to score one goal in the middle of the first half. Mehdi Ballouchy was voted as Man of the Match at the end of the game, scoring NYC FC's only goal, and tying the game during the second half. 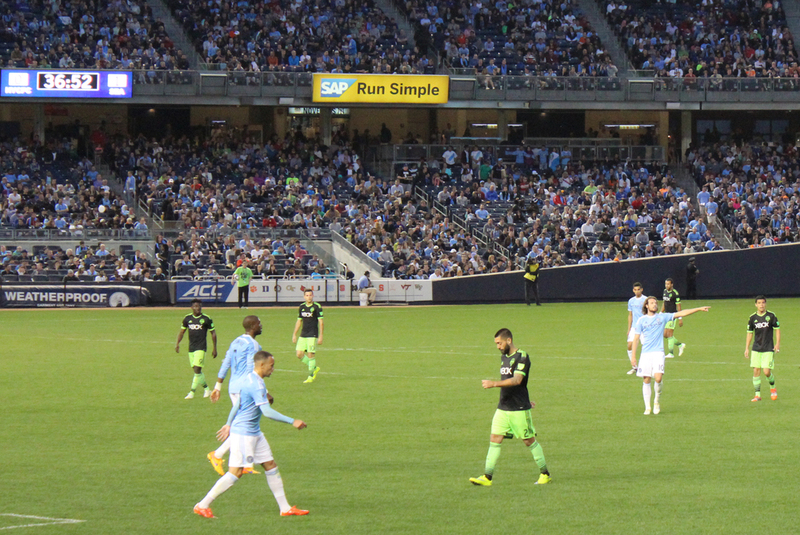 NYC FC's intensity did not carry through to the second round, as both Dempsey and Martins each managed a goal. Final score? 3-1, Sounders FC. I'm still cringing as NYC FC missed some fantastic opportunities to score in the second half. Villa nearly scored a goal, too. I don't know whether to attribute it to terrible luck or poor coordination. I finally broke out my newest toy, the Canon EOS Rebel T5, and managed to capture some interesting shots from front row field seats! Here are a few of my personal favorite action shots.. click the photo below to see the entire gallery. For more on soccer + sustainability, you can click here to check out my previous article, at Proud Green Home!